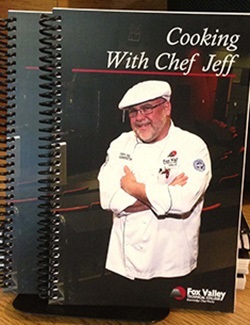 Chef Jeff, Department Chair for our Culinary Program, has recently written a wonderful cookbook and is selling them throughout the community with all proceeds going to support FVTC student scholarships. With the holidays fast approaching, I plan to buy several copies as gifts for my family members. This might be the perfect gift for someone you know as well. It’s a great cookbook and a great cause…ingredients for a successful initiative. What first attracted you to becoming a chef? When I started cooking professionally 30 years ago, the culinary profession was not at all glamorized like it is today. I started cooking because I like to cook and I liked to eat good food. You really never stop learning about food. It’s really amazing. How long have you been an instructor in the Culinary Arts Department at FVTC? I actually started as the Food Service Manager for the college 16 years ago, and have been teaching here for the past 14 years. I began my teaching career as a lab assistant at UW-Stout in 1987. What made you decide to create a cookbook? I had always wanted to produce a cookbook, but I ‘m not very good (nor interested in) the clerical side of projects. Pat Pollock, Business Technology Instructor, and the Administrative Professional club approached me in January and offered to compile my recipes for me, and I was all up for that idea. They have been amazing to work with. What is your favorite recipe? And, why? I honestly like all of my recipes, but the one at the top of my list is the Crispy Orange Chicken recipe. It is very light, fresh and flavorful. So, Jeff, what’s your inspiration behind doing a cookbook? Well, I only had two things that were of critical importance to me. First, I only wanted to provide 100 of my recipes so that if it is successful, I would produce another one down the road. Actually my plan is to produce 2 more, with one of them featuring primarily grilling, smoking, sausage and barbecue recipes. Second, I was pretty set on selling the book for $20, which admittedly is a tad higher than comparable cookbooks but I wanted it to raise funds for scholarships. One-hundred percent (100%) of the proceeds will be invested into an endowed fund that will generate scholarships in perpetuity. I believe that once people understand the rationale for the price, they will be supportive. The cookbooks are conveniently located at the following locations: Wire Whisk, Landreman’s Family Restaurant in Kaukauna, Bulk Priced Foods Shoppe, Fox Valley Technical College Bookstore (Appleton Campus-inside Entrance 10), The Meat Block, and all Community First Credit Union locations throughout the college’s district.